Created by the same six women -- the 'sisterhood' of the bestselling Monday Morning Cooking Club cookbook -- The Feast Goes On speaks of a community drawn together by food, telling intimate and moving stories of sharing and survival, love and hope, friendship and family. From precious family recipes that have been lovingly handed down the generations, right through to new classics that will become instant family favourites, from everyday eating to feasting, comfort food to traditional dishes, this is a cookbook of rich, wonderful ideas and flavours to nurture, nourish and inspire. The Feast Goes On will feed you, body and soul. Merelyn Frank Chambers, Natanya Eskin, Lauren Fink, Lisa Goldberg, Paula Horwitz, Jacqui Israel -- these six women from Sydney's Jewish community came together as friends every Monday morning to cook their favourite recipes and talk about food. Three words became their mantra: they wanted to SHARE the stories and recipes of their community, INSPIRE people to preserve their recipes, and GIVE all the profits to charity. 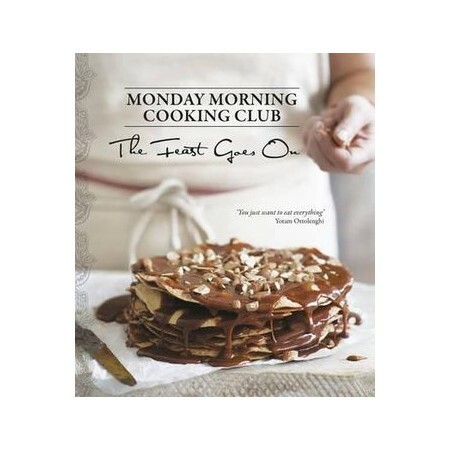 They published The Monday Morning Cooking Club in April 2011, and have never looked back.